Yes, it sounds incredibly cliche’ to say that a football game will be won in the trenches. Coming into this season, the biggest question mark surrounding the Ducks was whether or not they could be physical enough to compete with teams like Stanford or Michigan State. I was at both of those games, and I can confidently say the Ducks won the battle in the trenches. Since losing to Arizona early in the season, the Ducks have become the most dominant team in college football. For a team to beat Arizona and Florida State by 37 and 39 respectively, that says a lot. Every fight starts standing, so you can only show your ground game if you have the ability to take your opponent down. In football, every play starts at the line of scrimmage, and the team that protects its guys on offense and disrupts the opposing offense with its own defense will win every game. Let’s look at this more in-depth. 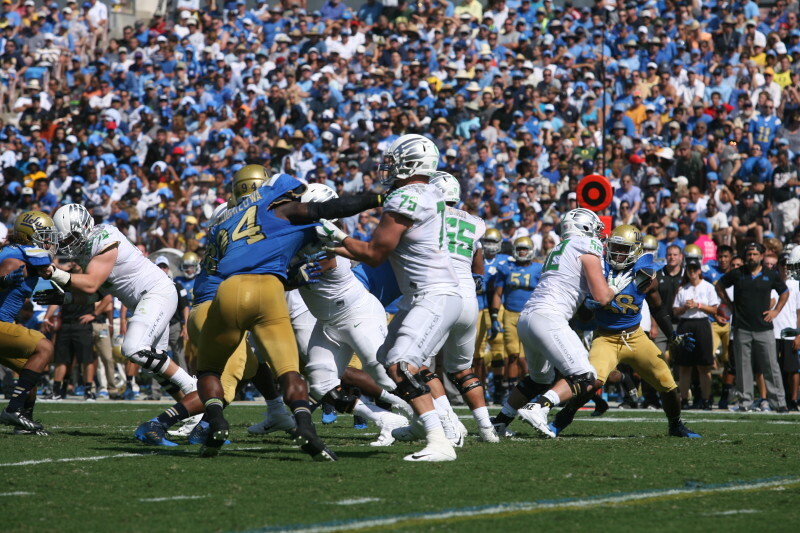 Oregon offensive line opening up some holes against UCLA. The season certainly did not start out well for the Ducks and the big guys on the O-Line. Before the first game, projected starting left tackle Tyler Johnstone was declared out for the season after undergoing double knee surgery. Thankfully, the Ducks had the outstanding Jake Fisher who was pinned as Johnstone’s replacement. During a blowout game against Wyoming, Fisher injured his left leg and missed multiple weeks in the middle of the season. Pre-season backup Andre Yruretagoyena suffered a leg injury against Michigan State, but thankfully only missed two games. Perhaps the biggest injury to the O-Line this season was the leg injury sustained by center Hroniss Grasu against Utah. Grasu missed the rest of the regular season, but returned to play in the Rose Bowl against Florida State, as the O-Line looked like it had finally gained that missing piece back. With all the ugly injuries now spoken of, let’s look at the potential of this line has as a cohesive unit. With Grasu back on the field, the offensive line is 100% complete. All missing factors are back in line, as Grasu can now take back his natural position from left guard Hamani Stevens who filled in during his absence. Going up against the Buckeyes will be no easy task. One guy that the Ducks must focus on is sophomore defensive end Joey Bosa. This season, Bosa amassed 12.5 sacks, to go along with being selected as one of two defensive ends on the First Team All-America Defense. Bosa is an absolute wrecking ball in the trenches, and to be honest, the Ducks have not faced anyone like Bosa this entire year. Bosa is a scary matchup, as Urban Meyer and staff will most likely line him up against freshman Tyrell Crosby. Crosby is no slouch on the line, as he has been very consistent this year for a young guy. It will be difficult, however, to stop someone of Bosa’s caliber. If I were on the field calling plays, I would certainly send help to whatever side Bosa is lined up on, whether it be Royce Freeman or calling for guards to pull. All in all, the Ducks have proven that they can control games in the trenches. If the Ducks can contain Bosa and company and set up the run-game, for example, it will help the pass-game, and vice versa. 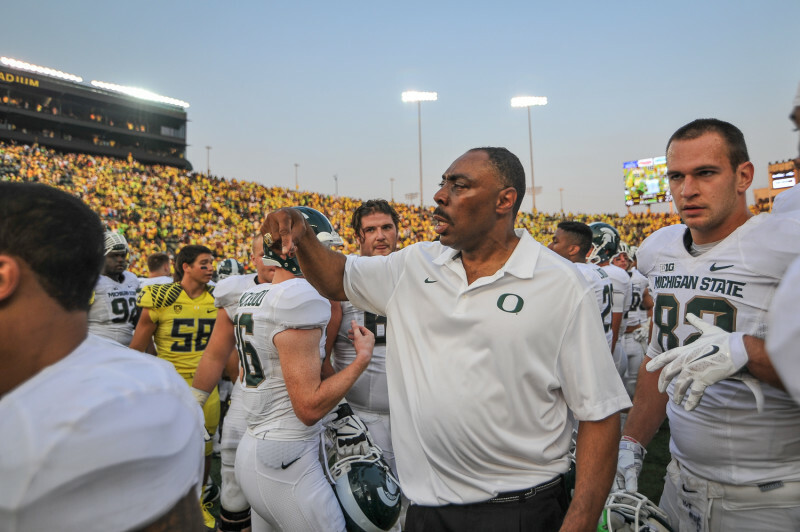 Ducks defensive coordinator Don Pellum after helping lead his team to victory against Michigan State. 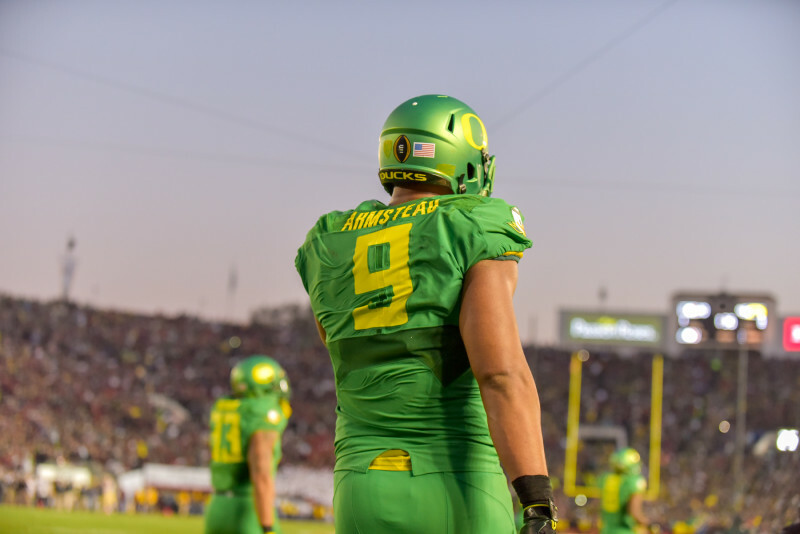 Where the Ducks have been criticized the most in the past is on defense. After Kiko Alonso and Dion Jordan left for the NFL, the Ducks have been hearing about how ‘soft’ its defense tends to be. With Nick Aliotti leaving before the season started, many people had questions about the defense. For me to say new defensive coordinator Don Pellum has done a good job this year would be a major understatement. Why do I say that? I say that because the Ducks squander 22 points per contest, meaning that they allow 26 fewer points per game then the offense averages. That alone, with nothing else being taken into consideration, is an incredible statistic. If the defense allows less points than what the offense scores, that is called ‘winning.’ The Ducks seem to have that figured out pretty well. Arik Armstead during the Rose Bowl. On the defensive line, the Ducks have two of the scariest guys I have ever seen in my entire life. Arik Armstead stands 6’8, and weighs in around 290 pounds. Opposite him, we have Deforrest Buckner, who stands 6’7, and weighs the same as Armstead. With two monsters on the line like that, opposing offenses have a lot to be scared about. This year, Armstead and Buckner combined for 6.5 sacks, pretty measly numbers considering the size of the two. While they both have pass rushing specifics to work on, Armstead and Buckner disrupt so many plays, based on their size. The height and speed of both guys forces opposing quarterbacks to make poor decisions, decisions that help the Ducks win. Between them, defensive tackle Alex Balducci has been doing a great job opening up spaces for the linebackers to come in and wreak havoc. It has been reported that Armstead is seriously considering forgoing his Senior season to enter the NFL draft. He also played on the Oregon Men’s Basketball team for a few seasons, but retired from the sport this year to focus on football, meaning that scouts and coaches believe he has a future in the NFL. While I think Armstead has a lot to work on with his game, he has athletic ability that is rarely seen in humans his size. I feel strongly that Armstead will have an incredible performance against the Buckeyes, because he will need to do that in order for the defense to stop quarterback Cardale Jones and running back Ezekiel Elliott. As I said earlier, it is easy to focus on one part of football and say that is the reason why one team will come to win. In this game, the national championship, it truly comes down to the battle of the trenches. For the Buckeyes, they have to focus on stopping Marcus Mariota and all of his weapons on offense. 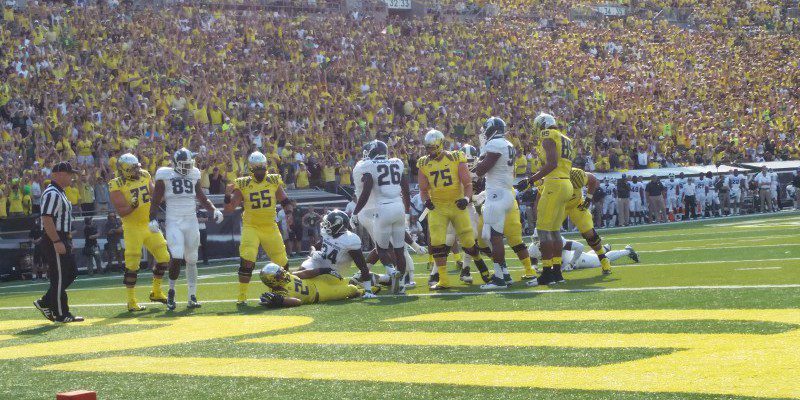 For the Ducks, they have to focus on stopping Bosa, and his buddies on defense. It is hard to say what the Ohio State offense will do, and yes, I know they beat Wisconsin and Alabama consecutively. Many people were concerned with the Ducks being able to stop Jameis Winston, but after forcing six turnovers, the haters turned into believers. FishDuck.com is the place to be for all things Ducks sports. The National Championship Game is right around the corner, and as always, you can come here for all the information you are looking for.